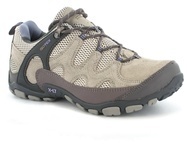 Regatta Ladies Hiking Shoes – Great for your Autumn/Winter Walks! They’re very comfortable straight from the box, with plenty of mesh in the uppers to help your feet breathe. Suitable also for women with wide-feet. Nice and warm shoes, so recommended for the colder months. The midsole is very soft, especially across the toes, and the heel is a little flat. The rubber sole gives great grip on rocky ground, and there’s a waterproof lining to help keep your feet dry.